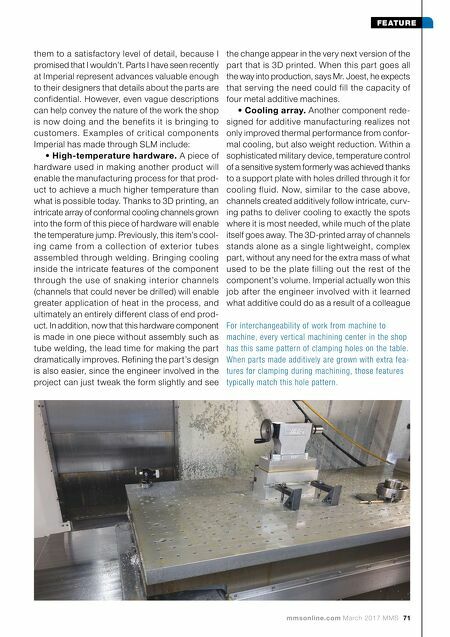 70 MMS March 2017 mmsonline.com FEATURE In fact, Imperial's experience so far illustrates why additive makes sense not just for a machine shop, but also for a smaller company. Imperial is just large enough to be able to afford to invest in additive, but it is also just small enough to be nimble in seeking and courting those "rock-your- world" customers Mr. Joest cites. What's more, Imperial is closely held enough to remain com- mitted and patient while waiting for successes in AM to materialize, which rarely happens quickly. One of the reasons profiting from additive manu- facturing today is so uncertain is because parts in production today have been designed for other manufacturing processes. The demand for addi- tive will come, and that demand will grow, only as fast as one engineer after another comes to see the geometric freedom that additive permits, and comes to create new parts that make good use of that freedom. PARDON MY VAGUENESS What are those new parts like? That is, what are some of the best cases of par ts designed for additive, parts that leverage the rock-your-world freedom? I can't show you. Really, I can't even describe Redesigning a part for AM often means eliminating unneces- sary solid sections of the part or replacing solid sections with lattice forms using less material, as the part above left illustrates. The component directly above and at left was originally solid except for the passages through it. Incorporating lattices cut the part's mass nearly in half. 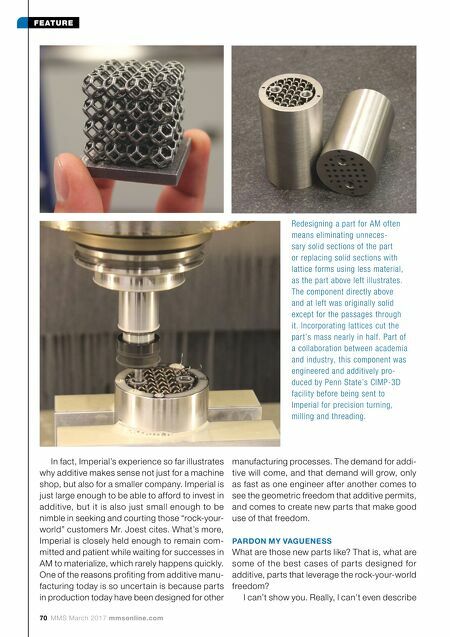 Part of a collaboration between academia and industry, this component was engineered and additively pro- duced by Penn State's CIMP-3D facility before being sent to Imperial for precision turning, milling and threading.